It’s that time of year again. The days are getting extremely shorter. And I mean that literally. I get out of class at 5:30 pm some days, it’s practically pitch black. I walk around Copenhagen adoring the lights and festive air, and it feels like it’s about 9 pm…when it’s actually 4 pm. Let’s just say, I’ve been taking a lot of Vitamin D supplements for the lack of sunshine. But, despite this slightly gloomy and dark weather here in Copenhagen, the bright and cozy attitude makes up for it one hundred times over again. Practically every street in central Copenhagen is lined with bright Christmas lights, and I can’t walk 100 meters without seeing some sort of flickering candle or smelling burning wood. 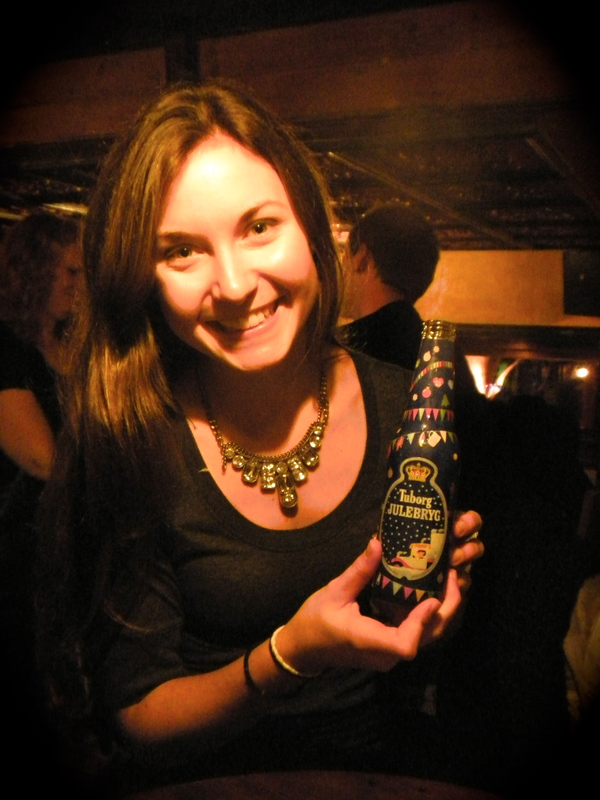 Surprisingly, this is the season of coziness and happiness here in Denmark…and lots of alcohol! 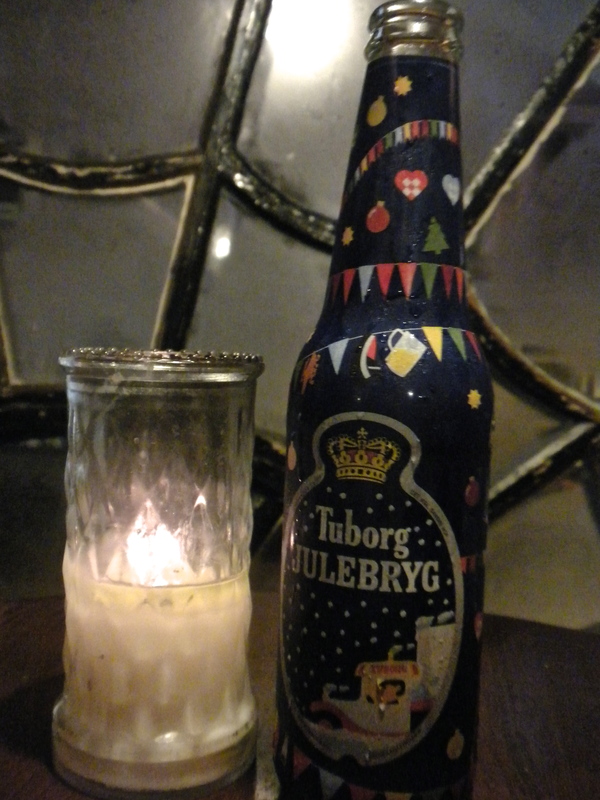 I mean, you should have seen the festivities when the Tuborg Christmas beer was released at exactly 20:59 on November 2 (known in Denmark as J-Day, Jule Day, to celebrate the release of Christmas beer). Huge blue Tuborg beer trucks rolled through the streets, covered in white foam, delivering the wonderful gift of the traditional Christmas brew to bars scattered throughout the city. Danes dressed as elves ran around singing and dancing with joy. And the Danes who weren’t dressed as elves? Well they were drinking that good ol’ beer, and drinking some more, with laughter and fun and smiles on their faces. And I know this how? Well, I decided to experience this little piece of culture, but with my will-power, I had just one Christmas beer. That’s probably very abnormal here in Denmark. Okay, okay I digressed. But, it’s a major aspect of Danish tradition, history, and identity, so it’s definitely worth mentioning! J-Day and the Christmas Brew. This Pub was plum full of people of all shapes and sizes welcoming the Christmas Season! And here’s the Julebryg (Christmas Brew), upclose and hyggligt. Back to the holiday Spirit. 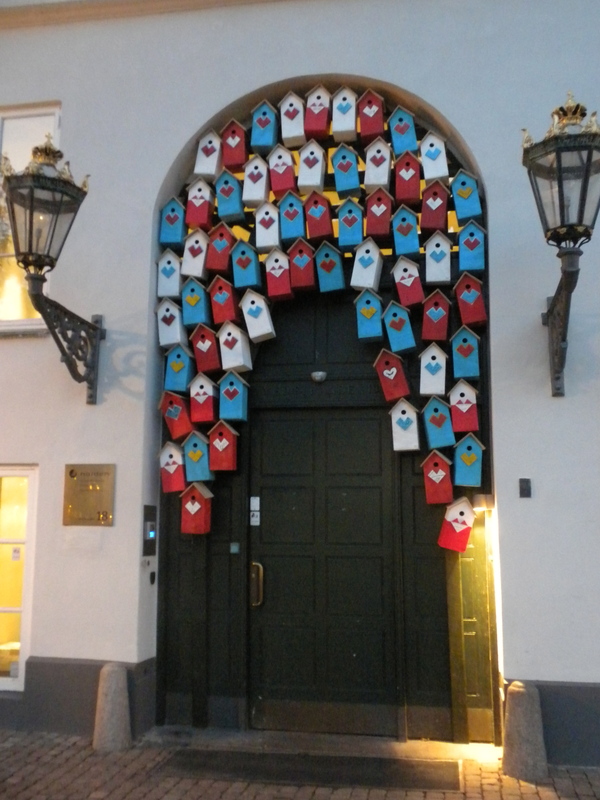 Copenhagen is absolutely, irrevocably beautiful when she’s dressed for the holiday season. All I want to do is wander through the streets, drink warm cocoa or coffee, eat a Danish pastry (or Wienerbrød ), stumble across the Christmas markets, and have a hyggeligt, cozy, warm, and happy time. But, of course, I must devote SOME of my time to class work. More like half of my time at least (I have to be a good student, too). I’m just very thankful to be in such a pleasant country during such a ultimately pleasant season. Now that’s a pretty turkey! Wednesday evening, I made puffy wheat rolls, slathered in honey butter, but they didn’t really turn out exactly how I pictured them, so I REMADE them the next morning. 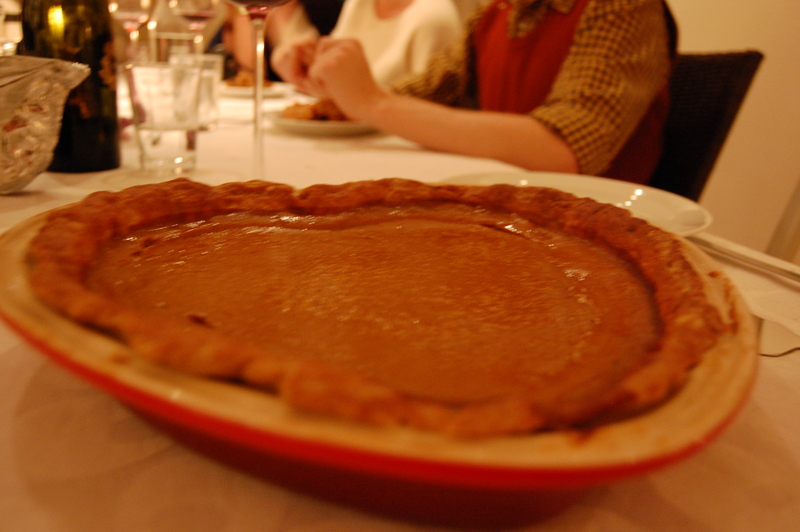 And then I made the all-time, you can’t have Thanksgiving without it, pumpkin pie. Mom and Dad, God Bless them, brought me cans of pumpkin puree from the US when they visited. I could only buy it one place here in Denmark that I know of…the candy store…for $10 a can. Um, no way. So they made me a happy camper or baker or whatever. I accented the pumpkin filling with a stubborn, but delicious whole wheat crust. Phenomenal! I also made a homemade cranberry sauce with fresh-squeezed orange juice, pears, and pomegranate seeds. I could literally eat that stuff on anything. It was awesome. 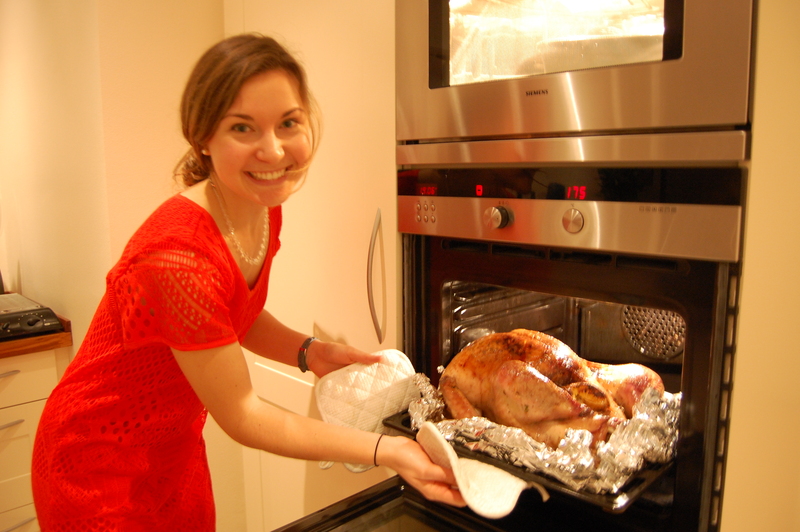 And for the savory…I cooked an entire 17 pound (7 kg) turkey all by myself. I stuffed it with oranges, onions, carrots, oregano, salt, pepper, and fresh parsley all covered in butter…and then I brushed the skin with oregano/salt/pepper butter and rubbed it under the skin as well. It was my first experience with whole turkey, and it ended up being moist and delicious! For sides, we had green beans sauteed with lemon juice, garlic , and leeks, and then mixed with feta as a final touch. Oh my goodness, my mouth is watering right now! So we also had sweet potatoes, sliced and covered with an apple juice, maple syrup mixture and topped with brown sugar, ginger streusal. And the stuffing had so many admirers! I made it with whole grain bread, leaks, apples, and cranberries. Couldn’t have been better, let me tell you. The Absolute Best Kitchen Crew – Thank you, Richie, Dylan, and Alisha! All Around the Table. Ready to Eat Thanksgiving Dinner with Friends! And top it off with Homemade Pumpkin Pie in Whole Wheat Crust. Yum! So now that you’re as hungry as a bear… I would like to say that I couldn’t have done all this without the help of my wonderful friends and host family. 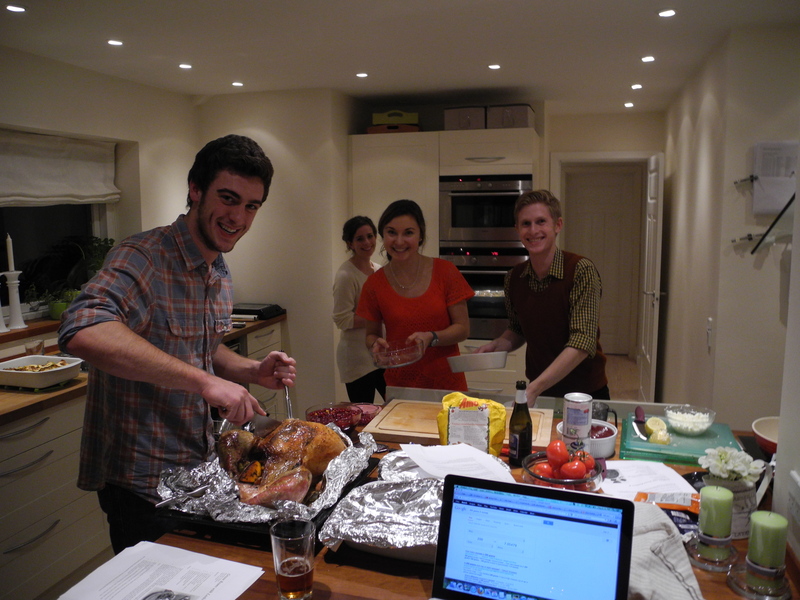 My friends came to my house around 5 or so in the evening, and did everything they could to help me complete the best Danish Thanksgiving meal ever. 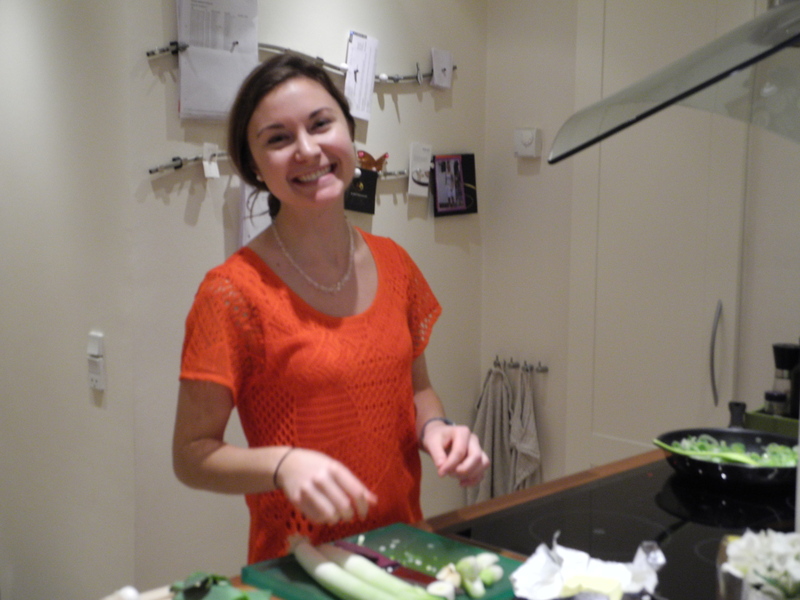 And my Danish host parents helped me shop for everything, and let me host the dinner in their house! They are truly amazing people, and I am so grateful that I ended up with them. The remainder of the evening, we played the Danish version of “Minute to Win It.” Richie’s host mom brought over a set of games to complete in one minute. Of course, we played Danes versus Americans. And, we surprised those Danes! Yes, they were very surprised that the Americans would LOSE! 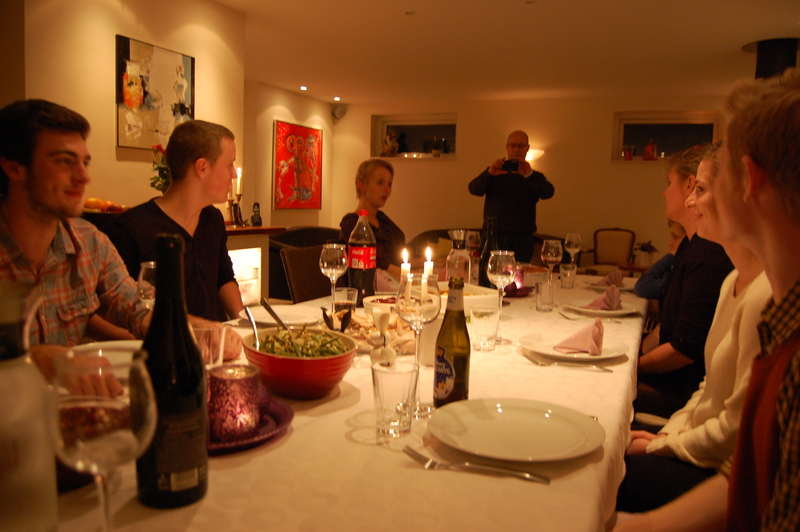 But, hey, we were full to the point of immobility…and I don’t think the Danes do Thanksgiving to that extent. So we had a good excuse, right? 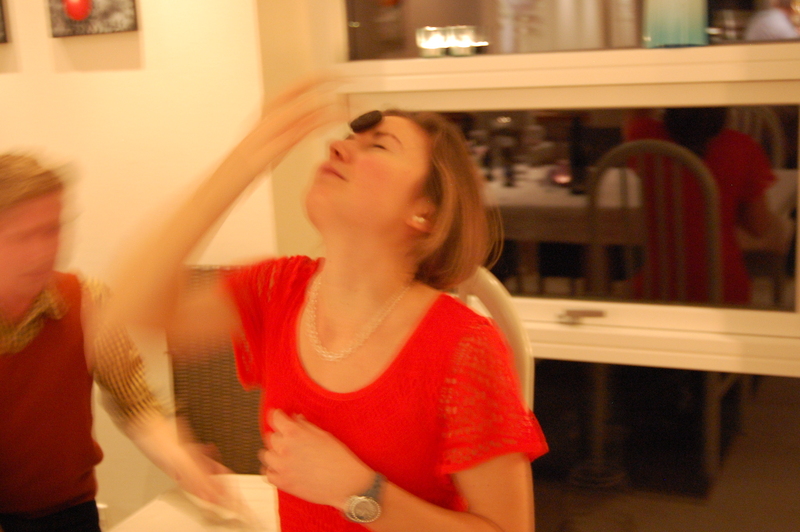 The Oreo Game – Try to Move an Oreo from your Forehead to your Mouth Without Touching It. This was HILARIOUS to watch. It was hard being away from my family for such a family-oriented holiday, but I am very happy that we were able to host a celebration of our own here in Denmark. And to share it with another culture!? That’s amazing to me. Different people and cultures learn from each other. That’s how acceptance and growth are rooted. The Danes like how we Americans are so proud of our country and have so much to share. They understand that feeling. They are so proud to be Danes! And, in turn, I love learning from the Danes and being “accepted” by their society, as the understanding, cultural person I have grown up to be. So thank you to all who have supported me on this expedition of self-growth and understanding. I believe an experience such as this (in some form or another) is needed for all individuals. Why not strive to learn as much as this 510,100,000 square meter world has to offer? You definitely are making us proud. We are happy that you are taking advantage of all the Life learning experiences as they come your way. Looking forward to the rest of your stories and your return Home.